LF1002- Men of Medieval Romanesque Period. Dark Ages to Early Medieval. A complete ensemble of men's clothing for noble and peasant interpretations, 1060� 1150 - Variations included two for the Noble and two for the Peasant look. Sizes S�XL. 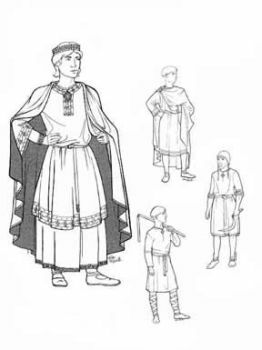 This pattern includes everything needed for a man's clothing for a Norman or Norman-styled (aka Romanesque) noble or a peasant from 1060-1150. Chainse (shirt) Cotte (tunic) Bliaut (over-tunic) Fretes (crossed gartering) Coif (cap) Circlet (crown). Instructions for mantle (cape), circlet (crown) Includes four chest sizes: 38" - 40" - 42" � 44 Historical notes regarding fabrics, colors, trims, sewing stitches, hair and beard. Multi-sized Small through XL (chest 38"-44"). Medieval, Renaissance, Dark Ages, Elizabethan.